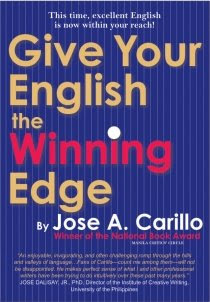 Jose A. Carillo, multi-awarded writer and editor, and an internationally awarded corporate communicator, is launching his third book on the English language entitled, Give Your English the Winning Edge. The booklaunch is scheduled on July 20, 2009 at 3:00 p.m. at Sampaguita Hall, The Manila Hotel. Jose Carillo won the National Book Award for Linguistics from the Manila Critics Circle in 2005 for his first English-usage book, English Plain and Simple: No Nonsense Ways to Learn Today’s Global Language. In mid-2008, Jose Carillo released his second book on the English language, The 10 Most Annoying English Grammar Errors. You can also check out his online English forum and his blog.